After more than two decades of often-intense competition, the score still isn’t entirely settled among three tennis-playing brothers: Damon, Jared and Jeremy. Jared speaks admiringly of older brother Damon and his skills on the court. “He’s a really good athlete with a huge serve,” Jared says. Jared’s twin brother, Jeremy, is equally as strong on the court. While Jared’s tennis game might not land him at Wimbledon, he says it’s his work ethic that really sets him apart. Recently promoted to Area Sales Manager for Enterprise Fleet Management in Pittsburgh, Jared has been known to make bold personal performance goals. Like the time a few years ago when he promised Chief Operating Officer Chrissy Taylor at the Fleet Management national sales meeting that she’d be awarding him a green jacket the next year, an honorary tradition for top Fleet sales performers. “I made that statement as a challenge to myself and used it as motivation – I had a strong year.” A Top Two performance, it turns out, made all the sweeter by the fact that both Damon and Jeremy were there to see Jared don his green jacket on stage. They both joined Fleet Management as Account Executives in 2016 – Damon in Atlanta, and Jeremy in Charlotte. Family ties certainly played a role in bringing the three brothers into the business. 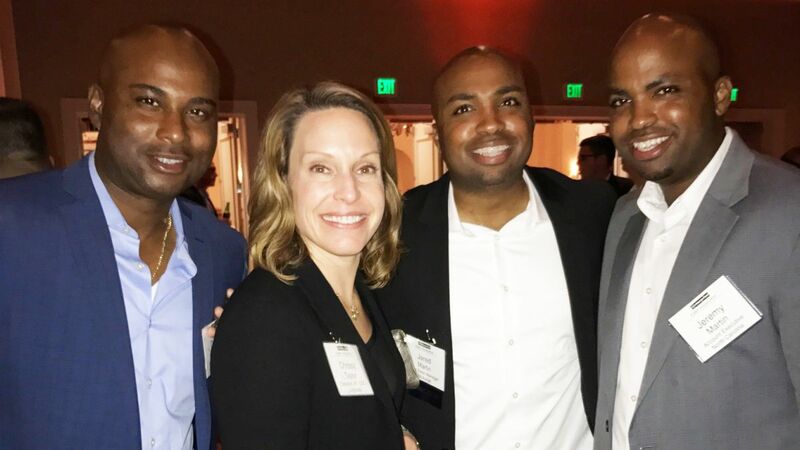 And all three were grateful to find Enterprise embraces the same kind of support, teamwork and competitive spirit they experienced in their tennis playing days – from junior tournaments through their undergraduate years at North Carolina A&T. Beyond business success, the brothers have learned to appreciate the authentic family feel they’ve encountered at Enterprise. “We’re all about making everybody better, every day, and that’s a great atmosphere to work in,” Damon says. It starts with the Taylors, according to Jeremy. Learn more about Enterprise’s commitment to student athletes at Athlete Network.